The U.S. Senate may act this week on a GMO labeling bill that would impose a federal labeling standard less transparent than the Vermont right to know law — scheduled to take effect Friday (July 1) — that anti-labeling advocates have been seeking to block. Described as compromise between Republican and Democratic leaders on the Senate Agriculture Committee, the bill would create a mandatory nationwide GMO labeling system, but would allow manufacturers to disclose GMO ingredients using digital codes and/or toll-free customer service phone numbers. This is dramatically different than the Vermont law, which requires explicit on-package labeling stating that the product contains GMO ingredients. As the below article from Sustainable Food News makes clear, the reactions by those on both sides of the issue were predictable. Food industry interests who want limitations on labeling hail the measure, while those favoring GMO transparency are strongly opposed. Because of upcoming summer congressional recesses, there appears to be no way that the bill will reach President Obama’s desk before the Vermont law takes effect Friday. Even if it passes the Senate, it would have to go through a House-Senate conference to work out differences between the Senate proposal and a House bill, which would have implemented a voluntary labeling regime, previously blocked in the Senate. It is not clear whether the president would sign or veto the bill if it is approved by Congress. Still, if you have a strong position on GMO labeling, you are urged to contact your state’s U.S. senators promptly. Passage in the Senate would of course make it more likely that the bill will eventually become law. FamilyFarmed and Good Food on Every Table thank Sustainable Food News for its permission to republish this article. Based in Portland, Maine, Sustainable Food News provides daily coverage of developments important to those with interests in the Good Food movement. For more information or to subscribe, please visit Sustainable Food News’ website. Leading lawmakers on the U.S. Senate Agriculture Committee Thursday reached a deal on legislation to create a mandatory, nationwide GMO food-labeling system that allows manufacturers to disclose genetically engineered ingredients using digital codes and 800-numbers rather than on-pack language. Both Roberts and Stabenow urged their Senate colleagues “to move swiftly to support this bill.” The call for quick action is because the legislation, which needs 60 votes to pass the Senate, would nullify the nation’s first mandatory, GMO-labeling law, which goes into effect in Vermont July 1. The bill would effectively ban any state effort to enact labeling requirements for foods made with genetically engineered ingredients. More than 90 percent of all soy, corn, sugar beet and canola is now grown using GE seeds. And, estimates put the amount of processed foods containing GMO ingredients – including cornmeal, oils and sugars – on grocery store shelves at about 85 percent, with consumers largely unaware of what they are eating. For the soybean industry, the new legislation is exactly what they were hoping for. “The work put in over the past year by [Sens.] Roberts and Stabenow has yielded a piece of legislation that gives consumers the information they want and need, yet doesn’t drive a proven-safe technology from the marketplace through the stigmatization that comes with language that could be perceived as a warning label,” said Ron Moore, American Soybean Association vice president. The legislation provides food manufacturers with several options to disclose GMO ingredients, including quick-response (QR) codes, 800-numbers, websites and on-pack labeling. The Grocery Manufacturers Association (GMA), which represents large food manufacturers, prefers QR codes, which requires consumers to scan bar, or QR, code on product packaging with their smartphones to find out if the item contains GE ingredients. “The disclosure requirement in the Senate legislation is consistent with the new reality: shoppers want more information about their food than is ever possible to provide on a label,” according to a statement from GMA, which refers to its QR-code, food-labeling scheme as SmartLabel technology. The legislation also narrowly defines bioengineering, which refers to a food that contains genetic material that has been modified through in vitro rDNA techniques only. That excludes new techniques described as gene drives, a type of gene editing, which intentionally spread gene modifications throughout a population of organisms. One example of a gene drive is CRISPR/Cas9. CRISPR (Clustered regularly-interspaced short palindromic repeats) are segments of bacterial DNA that, when paired with a specific guide protein, such as Cas9 (CRISPR-associated protein 9), can be used to make targeted cuts in an organism’s genome. The proposed legislation also exempts very small manufacturers and restaurants as well as foods that have meat, poultry, and egg products as the main ingredient. 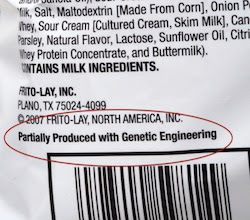 The legislation also prohibits food products from an animal to be considered bioengineered solely because the animal may have eaten bioengineered feed. After the Senate rejected a bill in March that would have created a voluntary labeling system for foods made with GMOs, while blocking states from enacting their own labeling laws, many major U.S. food manufacturers began rushing production schedules to comply with Vermont’s GMO labeling law. Multinational food giants including ConAgra Foods, Inc., General Mills, Mars Incorporated, and Kellogg Company, the world’s largest cereal producer, have all re-labeled products nationwide in anticipation of the July 1 deadline. Campbell Soup Company became the first major food manufacturer to label food products made with GE ingredients in January. It is anticipated that the bill will come to the Senate floor for a vote this week. Yet, Vermont’s law will still take effect on July 1 because Congress will not have enough time to get the bill passed by both the House and Senate, and send it to President Obama for his signature. This entry was posted in Food and technology, Food labeling, GMOs, Good Food Policymaking, Organic farming, Sustainable food standards and tagged Family Farmed, genetically modified organisms, GMO labeling, GMO labeling legislation, GMO right to know, GMOs, Sustainable Food News, Vermont GMO labeling law. Bookmark the permalink.